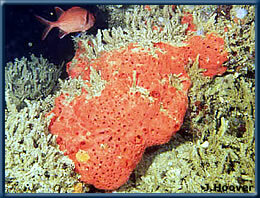 Orange sponge Mycale armata, copyright J. Hoover. Contains: Dendroricellidae, Microcionidae, Raspailiidae, Coelosphaeridae. The Poecilosclerida is a group of demosponges with discrete organic and inorganic skeletons, with discrete siliceous spicules (Hooper & Van Soest 2002). Characters (from Hooper & Van Soest 2002): Skeleton composed of discrete siliceous spicules; main skeleton composed of megascleres (monactinal, diactinal or both) and spongin fibres in various stages of development; both fibre and mineral skeletons showing regional differentiation such that megascleres are often differentiated into distinct ectosomal and choanosomal components; microscleres including meniscoid forms such as chelae, sigmas and sigmancistra-derivatives, and other diverse forms such as toxas, raphides, microxeas and discate microrhabds. Reproduction usually viviparous with incompletely ciliated parenchymella larva; rarely oviparous. [FA10] Fromont, J., B. Alvarez, O. Gomez & E. Roberts. 2010. Tetrapocillon (Demospongiae: Poecilosclerida: Guitarridae) in Australia, with the description of a new species. Records of the Western Australian Museum 26 (1): 70–86. [F79] Fry, W. G. 1979. Taxonomy, the individual and the sponge. In: Larwood, G., & B. R. Rosen (eds) Biology and Systematics of Colonial Organisms pp. 49–80. Academic Press: London. Hooper, J. N. A., & R. W. M. Van Soest. 2002. Order Poecilosclerida Topsent, 1928. 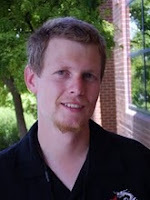 In: Hooper, J. N. A., & R. W. M. Van Soest (eds) Systema Porifera: A Guide to the Classification of Sponges pp. 403–408. Kluwer Academic/Plenum Publishers: New York. [L01] Lee, W. L. 2001. Four new species of Forcepia (Porifera, Demospongiae, Poecilosclerida, Coelosphaeridae) from California, and synonymy of Wilsa de Laubenfels, 1930, with Forcepia, Carter, 1874. Proceedings of the California Academy of Sciences 52 (18): 227–244.